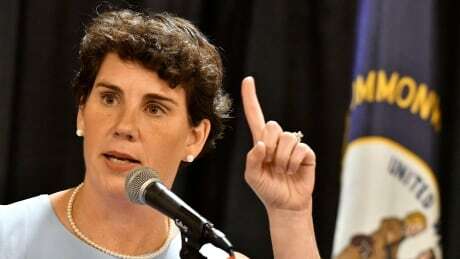 Congressional hopeful Amy McGrath has no time to talk to a reporter from Canada when she arrives for a potluck campaign rally in a small park just outside Frankfort, the capital of Kentucky. The Democratic candidate in the state's sixth congressional district is wearing blue jeans and sandals as she works through the partisan crowd. Everyone wants a word with her as she slowly makes her way to the microphone at the front of the picnic shelter. McGrath is a star candidate for the Democrats: a Marine fighter pilot who flew 89 combat missions in Afghanistan and Iraq before retiring with the rank of lieutenant-colonel. But this is a new mission. She is trying to win in a district that Donald Trump took by 16 percentage points two years ago, in a state where all but two of the 120 counties voted Republican red. If that's not enough, both of the state's senators, which include majority leader Mitch McConnell, are Republican. So are five of its six members of the House of Representatives. Kentucky's governor, Matt Bevin, is also a Republican. Being liberal in this neck of Kentucky is a tough sell even when you have a sterling military record. Even so, McGrath's not hiding her progressive leanings. She speaks without notes for 15 minutes. The issues she highlights could have been delivered by any Liberal politician in Canada: a promise to fight for affordable health care. Good quality jobs. An economy that works for everyone. "For the average person wages haven't increased. In fact with inflation they've gone down while gas prices go up, the price of consumer goods go up. And I don't think the answer to that is to cut taxes for the wealthiest. I just don't," she said. Kentucky's sixth is a mixture of urban and rural communities. Affluent and poor. The state's famous bourbon trail winds through the rolling hills north of Lexington, past palatial estates owned by horse breeders and the distilleries with old limestone warehouses and much newer visitors centres to deal with tens of thousands of tourists who visit each year. It has the capital and, to the east, smaller and far less wealthy communities nestle up against the coal-mining communities of Appalachia. What makes this race interesting is that it really shouldn't be a race at all. Her opponent, three-term incumbent Andy Barr, has increased his margin of victory in each election. He's a fiscal conservative who voted in favour of Donald Trump's tax reform package, and to repeal the Affordable Health Care Act. But Barr knows that mid-term elections, held halfway through the presidential term, can be a referendum on the president. Barack Obama lost control of the House of Representatives in 2010. Trump's polarizing style is an added issue, and Barr senses it. "I readily acknowledge to all my constituents — both supporters of the president and my constituents disappointed with the outcome of the last election — that this country is divided just like this district is divided," he told CBC News after announcing new funding for addiction recovery at a support centre for addicts and their families in Lexington. "But what I tell everyone — whether they voted for Hillary Clinton or for Donald Trump — what I think can unite this country is prosperity." That this race is competitive speaks to another kind of divide, one The New York Times dubbed as "a battle of ideology versus resume." McGrath has raised millions of dollars, some of it from celebrity donors outside the state. Her first ad, highlighting her military service, went viral online. The Republican National Committee put Barr on its list of "must re-elect" incumbents in 2018, channeling money for an early influx of attack ads against McGrath, each one branding her as just too liberal for Kentucky and as a self-described feminist. "I don't call them negative ads. I call them ads in her own words," Barr said. Polls suggest the contest is too close to call. And that's only added to the national interest. "If Amy McGrath wins this race, the Democrats will take the House of Representatives," says Ben Chandler, the former Democrat who represented the district from 2004 until he lost to Barr in 2012. He is utterly unconvinced that the Barr campaign's attempt to brand her as a liberal in a deeply conservative state will work. "Amy McGrath is a war hero, Amy McGrath is a mother of three who has killed terrorists," he says. "Now, I don't know too many people who have that profile." Not everyone is so convinced that McGrath will win, or that this district — which even Chandler describes as "old, rural and white" — is a bellwether for the Democrats' effort to regain control of the House. "I'm not counting her out," says Steve Voss, professor of political science at the University of Kentucky in Lexington. He says Barr needs to break with the president over the steel and aluminum tariffs, which has led to retaliatory tariffs being imposed by Canada and other foreign countries against the district's iconic and economically significant bourbon industry. But a win here for McGrath isn't a guarantee that a Democratic wave is building. "This [race] is generating a lot of popularity, publicity and excitement. They can win this one and not do especially well." Don't tell that to McGrath's supporters. "President Trump carried Kentucky but after he got in there awhile he told so many lies that I think people are ready for change. I'm looking for change in the mid-terms," says Carl Campbell, a retired vet wearing a weather-beaten U.S. Marine Corps cap. McGrath will need to a lot more people like Campbell who are prepared to compare her record with that of the president's. It's already helped to make a race in a district where there wasn't supposed to be a race at all.